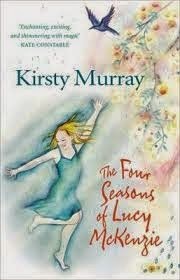 I have a lovely one for this week's Timeslip Tuesday-- The Four Seasons of Lucy McKenzie, by Kirsty Murray (Allen and Unwin, July 2014 in the US, 2013 in Australia). I am not alone in thinking it is lovely--it won Best Children's Book in last year's Aurealis Awards (Australian awards for spec. fic.). Eleven-year old Lucy must go stay alone with her eccentric old aunt in the old over-grown family home out in the bush. Her older sister Diana, studing music in France, had an accident and is in a coma, and her mother has gone to Paris to be with her. Her father must travel for work. So the only option is Aunt Big. Lucy is not happy. She's anxious for her sister, very uncertain about gruff Aunt Big, and pretty sure she'll be bored alone in the middle of no-where (with no electronic devices on hand). When she first sees the painted room downstairs--each wall decorated with the surronding landscape, one wall for each season--she doesn't care for it--she feels the outside should stay out. But then one night Lucy cannot sleep...and magic happens when she enters the painted room, and follows the girl in the picture of spring who is calling to her. And Lucy is back in the late 1930s, with a girl named April who could almost have been her twin, who lives in the same old family house, in this time a loved and lived in home. Lucy travels through each season in turn, growing closer to April, her siblings, and her friend Jimmy. Twice she is a hero, thanks to her study of Bush Fire Safty pamphelts at Aunt Big's house in the present, and thanks to her lifesaving course. And all the while in the present Lucy and Aunt Big are growing closer together to, in a most satisfying way. I enjoyed it thorougly. The mystery of who April is is easy to guess, but that makes the interactions of Lucy and her aunt more meaningful. If you are at all a fan of Tom's Midnight Garden, you must read it. If you are a fan of intergenerational friendships, read it. If you like lovely descriptions of beautiful places, and kids being kids, read it. Tom's Midnight Garden-- sigh. Looking for a copy right now. You should get The Greenglass House from netgalley.com. It becomes fantasy on page 340 or so. I am also sold! This sounds terrific. I sure hope you all like it!